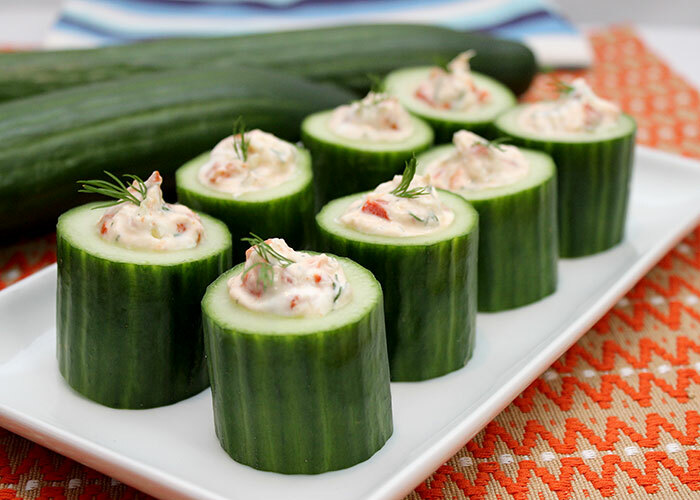 Cut the cucumber into 1½ inch pieces. Scoop out the center with a melon baller, making sure to leave the bottom intact to create a cucumber shot glass. Set aside. Place the drained yogurt, onions, roasted red pepper, crab meat, cayenne, maple syrup and lemon juice in a bowl. Mix all together. Season with sea salt and pepper to taste. Scoop or pipe the mixture in the cucumber shot glasses. Serve. Tip: This makes a great treat for the kids. They will enjoy helping to make the cucumber shot glasses. If crabmeat is not to their liking, use chopped celery instead. To drain the yogurt: Place a tea towel over a bowl and secure with an elastic. Put 1 1/2 cups full-fat yogurt on top of the tea towel. Allow the yogurt to drain at room temperature for at least 2 hours to thicken the yogurt. The longer it sits, the thicker the yogurt will get and can be as thick soft cream cheese.